$799. 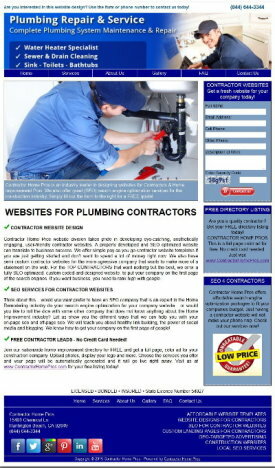 Contractor Websites - Includes all SEO work FREE! 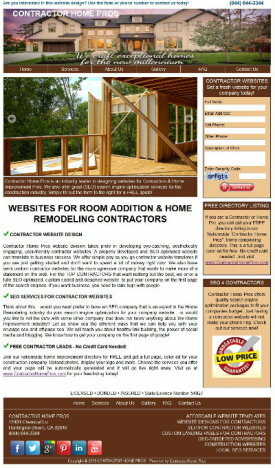 For the contractor that wants a custom construction industry website that is fully loaded with all the great features and wants it done with all the on-page SEO work included. 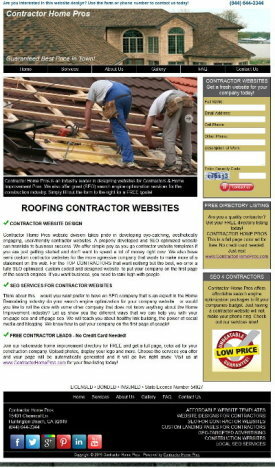 We will make sure that your contractor website is set up and ready to work for you, showcasing your companies work. Having a website for your construction company is great... but if you don't build it right with all the correct Search Engine Optimization, the search engines will have a hard time knowing what your page/company is about and you most likely will not rank.... That Means NO SALES! for your construction company website. 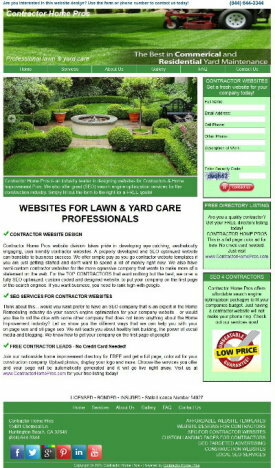 $1500.00 Contractor Website | $799.00 - For a 7 page website fully SEO optimized / Pages = home, contact, photo gallery, about us, and 3 more of your choice. You supply all text & graphics. We will build your photo gallery, set up all pages, configure the contact us page and do all the on-page SEO work for better rankings! We will help you register a name if you don't know how. Free on-page SEO ($150.00 per page value) When you buy additional pages! Let us know how we can help your company grow! As a contractor, you understand that even as you are working on one project you have to be lining up your next. This is not always easy, especially when you are competing with numerous others for the same jobs. The key is to get noticed first by being the easiest to locate and making certain that every potential customer understands why you are the best choice for them. 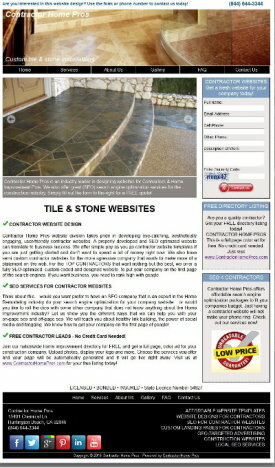 Contractor Websites and Templates help to get you noticed. These allow even those who are novices with website design to create a beautiful site that will make them look like the accomplished professional they are. 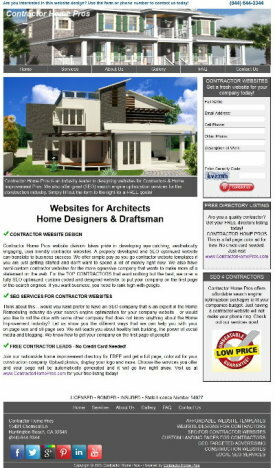 With the Contractor Websites and Templates, you will be able to get much more than just a place to advertise your skills. Custom website designs for contractors are also available that include as a part of the site, SEO services that help to get your site to the top of the search pages. This will put your listing at the top, ahead of all of those cut-rate contractors who only advertise with flyers. 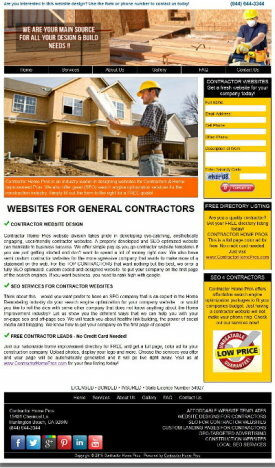 Signing up to use the Contractor Home Pros Websites will also get your company Free construction job leads and Free contractor job leads that are in line with your skills and within your area. 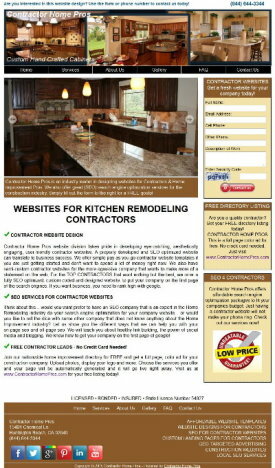 These extras make the Contractor Websites and Templates basically free to use almost immediately and can potentially be the most profitable advertising investment you will ever make. It is not uncommon for potential customers to see a newspaper advertisement or be given a business card and look up the website online before they make any calls. If you are not taking advantage of the Affordable websites for contractors, you could be passed over for a company they can actually research. What the Contractor Websites and Templates offer is the opportunity to provide details about your company that will encourage people to learn more. Include license numbers, photos of previous jobs and include customer testimonials. Use the Contractor Websites and Templates to give them all of your contact information so they can feel comfortable that you are a legitimate business they can trust. 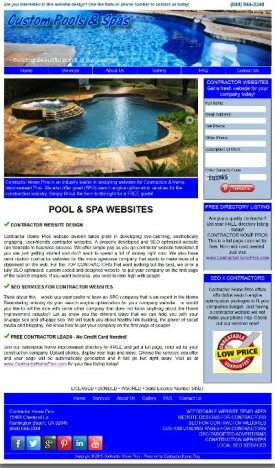 Contractor Websites and Templates put you where the customers are, online. This is where people search today for recommendations and information for anything they need. If you are not putting yourself in a position where you will be found by these people, your business may not be able to survive.